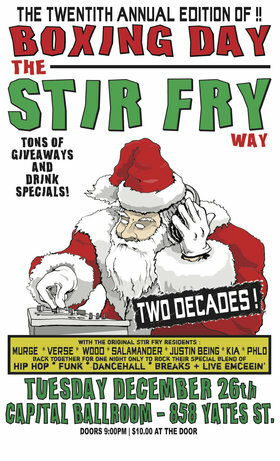 The Original Stir Fry residents are back once again with their unique blend of club bangin' Hip Hop, Dancehall, Electro, Mash-Ups, Breaks, & live emceeing' and this time they will be continuing the adventure at the CAPITAL BALLROOM! Performing Live on 4 turntables... MURGE, VERSE, SALAMANDER, WOOD, JUST B, PHLO, & KIA. Get your picture w/ Drunken Santa.! He'll be in the house giving away gifts to all the Bad Girls and Boys. The hands down best Boxing Day Party in Victoria, often imitated but never duplicated, the Original Stir Fry Collective will rock ya socks off. Tons of drink specials and free Holiday Cheer!